freedom, connection and experience through travel. 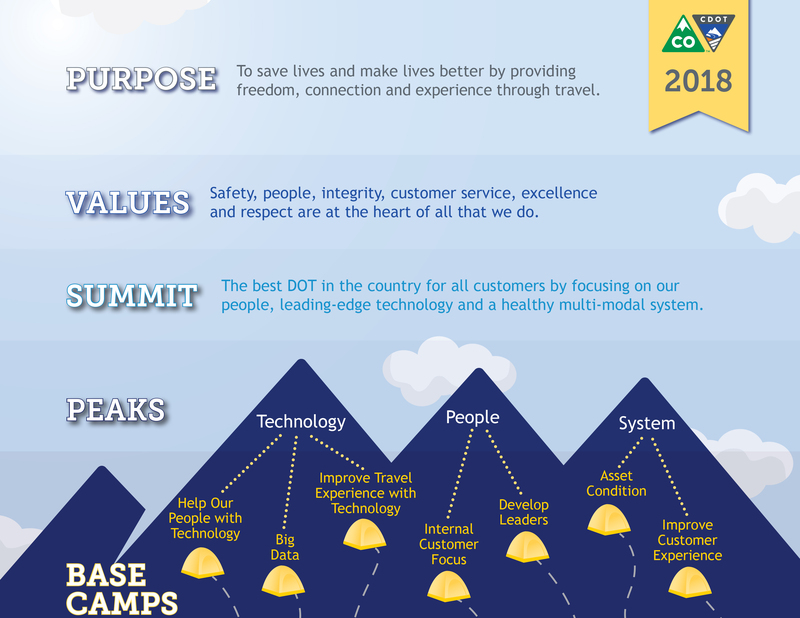 The best dot in the country for all customers by focusing on our people, leading-edge technology and a healthy multi-modal system. Healthy Multi-Modal System: enhancing our roads, bridges and multi-modal options to get our customers where they need to go more safely, easily and more confidently than ever before. To enhance the quality of life and the environment of the citizens of Colorado by creating an integrated transportation system that focuses on safely moving people and goods by offering convenient linkages among modal choices. To provide the best multi-modal transportation system for Colorado that most effectively and safely moves people, goods, and information. SAFETY - We work together to achieve a high performing safety culture! We promote and apply consistent and sustainable safe work behaviors in everything we do. PEOPLE - We value our employees!We acknowledge and recognize the skills and abilities of our coworkers and draw strength from our diversity and commitment to equal opportunity. INTEGRITY - We earn Colorado's trust! We are honest and responsible in all that we do and hold ourselves to the highest moral and ethical standards. CUSTOMER SERVICE - We strive to provide the highest level of customer satisfaction and experience! With a can-do attitude, we work together and with others to respond effectively to our customers' needs. EXCELLENCE - We are committed to quality! We are leaders and problem solvers, continuously improving our products and services in support of our commitment to provide the best transportation systems for Colorado. RESPECT - We treat everyone with respect! We are kind and civil with everyone, and we act with courage and humility.